The previous chapter described how the Synchronization process works and described how XpertMart™ uses dates to decide what data is new and needs to be sent between the Main and the Remote stations. However, this explanation assumes that the synchronization is up and running--i.e. during the synchronization the system is explicitly not send all of the catalogs and documents back and forth, only data that has changed. Running the Initialize Catalogs process will create synchronization files in the C:/Main/Out folder that contain the entire contents of the catalogs. One file will be created for every catalog. Unlike normal catalog synchronization files that end with either a .xfn or .xtm extension, the files created through Initialization end with a .xin extension. These .xin files, unlike the normal catalog synchronization files, do not have a date as part of their name. Compare for example the BRANDS00020030504.xfn file with the BRANDS000.xin file. The former contains only new data created or modified on May 4, 2003 whereas the latter contains all data in the Brands Catalog. All .xin files are therefore, larger in size than .xfn or .xtm files. Because Initialization files are larger, the synchronization cycle will take a lot longer. Uploading, downloading and processing these files may take 30-60 minutes for each step. It is precisely for this reason that after you've synchronized the Catalog Initialization you should then run the Catalog Synchronization process thereafter. There is no harm in Initializing Catalogs more than once and synching them out to the stores; the data will not duplicate, but the process is unnecesarily slow compared to the normal synchronization cycle . Once the .xin files have have been created and are in the Out folder, these can be uploaded to the FTP Server by going to Synchronize>Catalogs>Upload Catalog Initialization. This process works the same way that Upload Catalog Synchronization does. Similarly, the .xin files are dowloaded at the Remote by running the Synchronize>Catalogs>Download Catalog Initialization process. This process works the same way that the Download Catalog Synchronization does. Once the .xin files have been downloaded to the C:/Main/In folder at the Remote, they can be process by going to the Synchronize>Intialize Catalogs. This process works the same way that the Catalog Synchronization process does. The Catalogs that were originally created at the Main are now visible at the Remote and can be used to run transactions. 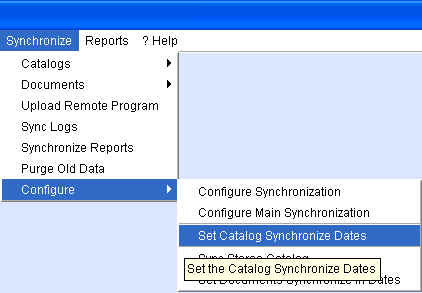 Once Catalogs have been Initialized and synched-out to the stores, you should begin to Synchronize Catalogs regularly. As was discussed in the previous chapter , synchronization is based on the system comparing the date of the last synchronization to the date of the synchronization files that are downloaded and processed. This will open a window that lists every Catalog on the left and, on the right side, the date the Catalog was synchronized or processed and the date the Catalog was sent or uploaded to the FTP. In the example below, the Lines Catalog was synchronized and uploaded on February 18, 2002. 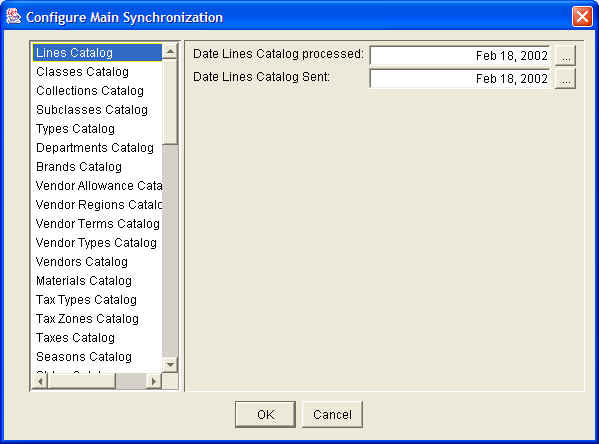 This means that the next time you run the Synchronize Catalogs process, the system will look for every field in the Lines Catalog whose DLM (Date Last Modified) is on or after February 18, 2002. Any modification made to the Lines Catalog prior to February 18, 2002 is assumed to have already been synchronized out to the stores. 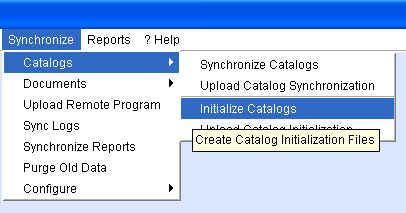 When you run the Initialize Catalogs process, the date of the initialization will automatically be written into the Configure Main Synchronization window for every Catalog appearing on the left side. The dates in the window get updated every time Catalogs are successfully synchronized and uploaded. 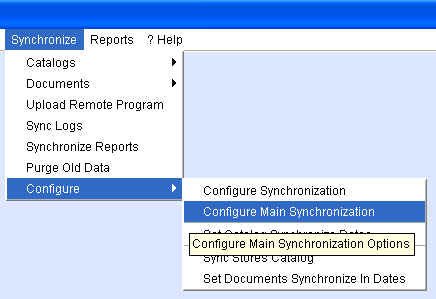 The Configure Main Synchronization window can also be used to change the date of last synchronization for a particular catalog. The browse buttons the left of the two date fields opens up the XpertDate ™ tool which you can use to change the date. If you change the Date Lines Catalog Processed to February 15, 2002 and you next Synchronize Catalogs on February 19, 2002 it will create .xfn synchronization files for February 15, 16, 17, 18 and a .xtm synchronizaiton file for the 19th for the Lines Catalog whereas for every other Catalog it will only create an .xfn file for February 18 and a .xtm file for the 19th. If you want to change the date of last synchronization for every catalog at once, use the Set Catalog Synchronization dates process. This will open a small window that lets you input a new date using the XpertDate™ tool . 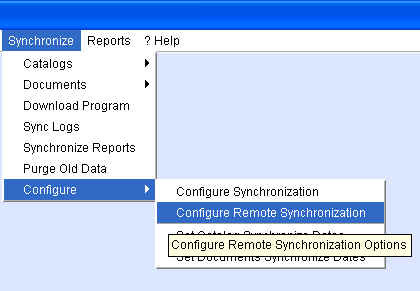 The next time you open the Configure Main Synchronization window you will see the new date you set for every catalog. You can then modify the dates of individual catalogs if necessary. 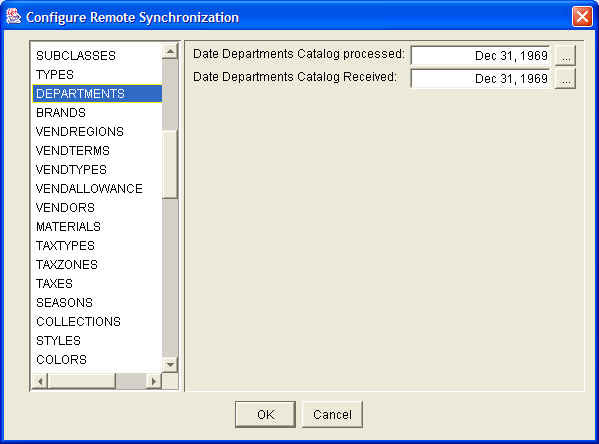 The Set Catalog Synchronization Dates can also be used at the Remote. Whereas this feature is used at the Main to tell the system which files it needs to "send" (synchronize and upload), this feature is used at the Remote to tell the system which files it needs to "receive" (download and synchronize). IMPORTANT NOTE: The "send" and "receive" synchronization dates must match. XpertMart™ will not process a synchronization file file if it doesn't first process the synchronization file of the immediately preceeding date. 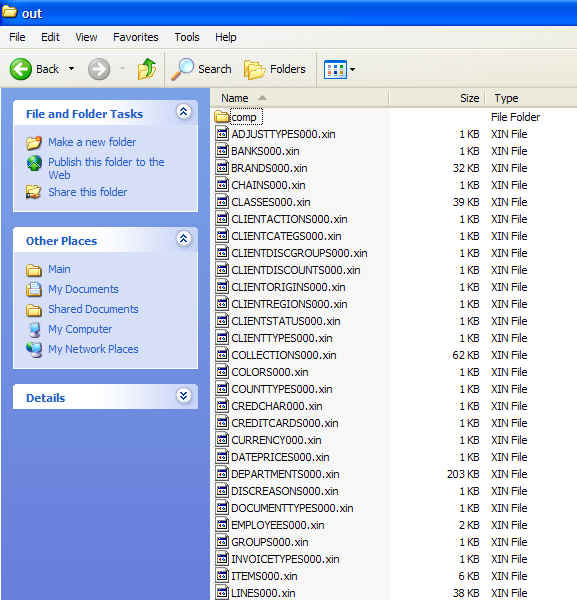 For example: suppose that at the Main synchronizaiton files are created for May 1, May 2, May 3 and May 4. The PRICES00002002501.xfn file sets the price of a certain item at $45 because it is on sale. However, the PRICES00020020503.xfn file sets the price at $55 because by May 5th the sale is over. If XpertMart ™ processed synchronization files out of order, it might first process the PRICES00020020503.xfn file (setting the price at $55) and then process the PRICES00002002501.xfn setting the price, incorrectly, at $45. Therefore, XpertMart™ will always process synchronization files chronologically and will stop any time there it does not find a file for the immediate next day. If you suspect that modifications to certain catalogs have not been sent or received by the stores, you can use the Set Catalog Synchronization Dates feature to rectify the problem. See the Monitoring & Troubleshooting the Synchronization chapter for more details. This will open a window that displays every Document type. (As discussed in the Synchronize Documents section of the previous chapter, each document type is actually snchronized in parts: the document header, the document detail and, in the case of Invoices, the document footer with payment date). On the right side, the last date Documents were synchronized and uploaded is displayed. In the example below, Invoices were last synchronized on May 5, 2003. However, the last time these were uploaded to the FTP Server was May 2, 2003. This tells us that there are some document synchronization files that are sitting in the C:/Main/Out folder that have not yet been uploaded. 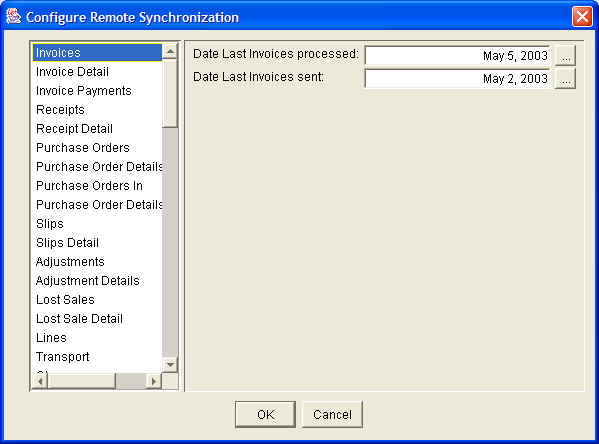 The Configure Remote Synchronization window also shows the last time every Catalog was successfully downloaded or received and the last date each catalog was synchronized or processed. The Catalogs appear on the left side below the Document types. In the example below, the Departments Catalog has not yet been received. (The default date the system writes into these date fields is December 31, 1969). The date of last synchronization for any Document type or Catalog can be changed by clicking on the browse buttons to the right of the two date fields. 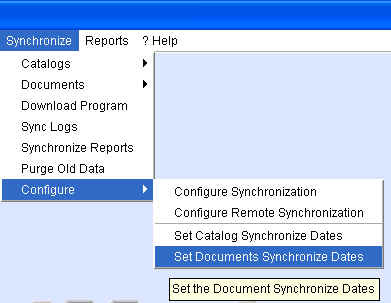 If you want to change the synchronization dates of all documents, use the Set Documents Synchronize Dates function. This will open a small window that lets you input a new date using the XpertDate™ tool . The synchronization dates for every document will be set to the date you input into this window. This will tell the system from which point forward it should "send" documents out to the Main. The new date is now visible at the Configure Remote Synchronization window . The same process can be run at the Main, only this time you are telling the system from which point forward it should "receive" documents from a Remote. When you run this feature from a Main it will ask you to specify the store. The synchronization dates of each store are configured individually. Because the Main is receiving transaction data from more than one Remote, information about the last synchronization date for documents is stored in a catalog where multiple records or stores can be stored and viewed. This is the Sync Stores Catalog which can be opened by going to Synchronize>Configure>Sync Stores Catalog. The Sync Stores Catalog functions like any Catalog : it has the same Toolbar at the top and the Records Bar at the bottom right-hand corner displays the total number of entries in the catalog. There should be one entry in the Sync Stores Catalog for every store in the chain. At the top of the Catalog you can see the Store Number you are looking at and a checkbox that shows whether it is inactive. If a store is Inactive it will neither send out document data or receive catalog data. The rest of the Sync Stors Catalog is divided into two halves. The left side shows the last date that document synchronization files were downloaded from the FTP . The right side shows the last date Document types were processed or synchronized in. 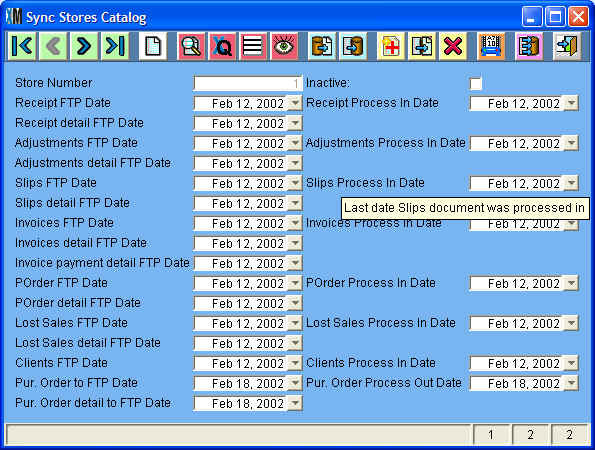 In the example above, the three synchronization files that make up Invoice data (Invoies, Invoice detail and Invoice payment detail) were all downloaded from the FTP on February 12, 2002. These files were then used to synchronize Invoices on the same date. Purchase Orders were successfully synchronized on February 18, 2002. The dates that appear in the Sync Stores Catalog can all be modified by pressing the button to the right of the date field. The Sync Stores Catalog is therefore a very important tool used to monitor and troubleshoot the synchronization process. If you discover that transaction data from a certain dates has not made it to the Main, you can always change the synchronization dates using the Set Document Synchronization Dates process. Perhaps an even easier method, however, is to use the Regenerate Documents process. This process will open a window that lets you enter a date range for which XpertMart™ will create document synchronization files and place them in the C:/Main/Out folder. 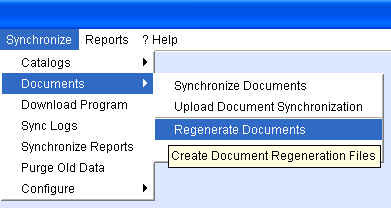 In the example above, the system will create document synchronization files for every day from January 1, 2002 to February 5, 2003. You must then upload them to the FTP Server. The Regenerate Documents function is a useful tool if you want to "play it safe" and make sure that all of the transactions from a certain date have been properly synchronized. Regenerating Documents is akin to a "do-over". If you Download and Process Document Regeneration at the Main you will replace the document data you previously had (for that store) with the new files you created.